Usually towards the end of the year, we always hear about how many players the Texas Rangers have used overall in any particular season. The Rangers are usually towards the high end of that list. Injuries, callups, usually make for a long list, and you tend to forget the guys who are here so quick that they don’t even have time for the proverbial “cup of coffee”. I’ve done this for the last seven seasons, and it’s worked out pretty well. I’ve also gotten some positive feedback on it, so it’s become a permanent feature here. If you’d like to see the final tallies for the other years I’ve done this, you can still see them here: [ 2008 | 2009 | 2010 | 2011 | 2012 | 2013 | 2014 ] Anyway, this post will get bumped whenever there is a player who is making his first appearance for the Texas Rangers in 2014. I am going to count guys who get called up, but don’t play immediately (or sometimes don’t play at all), as they will be part of the 25 man roster officially. So here goes. Luke Jackson was originally called up August 7th, and stayed for a few days but didn’t play. Only 8 players on starting 25 were on the roster last year. 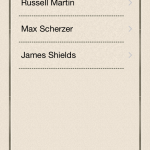 Apparently the Rangers don’t officially count guys who are called up and sent down without actually playing – but I do. 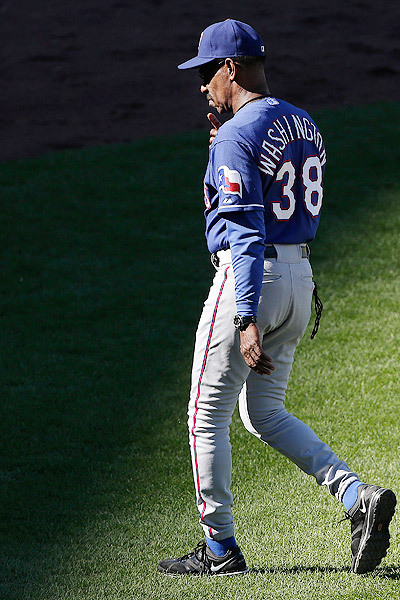 In 2015, the Rangers have 3 in the original opening day 25 that are making their major league debuts). The previous years’ counts in that regard were one in 2014 ( (Seth Rosin), 2013 (Leury Garcia & Smokin’ Joe Ortiz), 2012 (Darvish & Ross), one in 2011 (Mason Tobin), none in 2010, one in 2009 (Elvis Andrus), and one in 2008 (Kaz Fukumori). This will mark just the 3rd time in Rangers history that 3 players with no previous major league service time have opened the season with the club: 1974 (Mike Cubbage, Mike Hargrove, Jim Sundberg) and 1986 (Pete Incaviglia, Mitch Williams, Bobby Witt). This is the 1st time Texas has ever started a year with 2 players selected in the previous December’s Rule 5 Draft, the 1st in the majors since Milwaukee in 2003. I think social media has played a big part in my interest in all of this. However, with all the official sources, the beat writers, players themselves, and just regular bloggers all in the mix, it can be a bit of a cacophony to keep track of without going nuts. 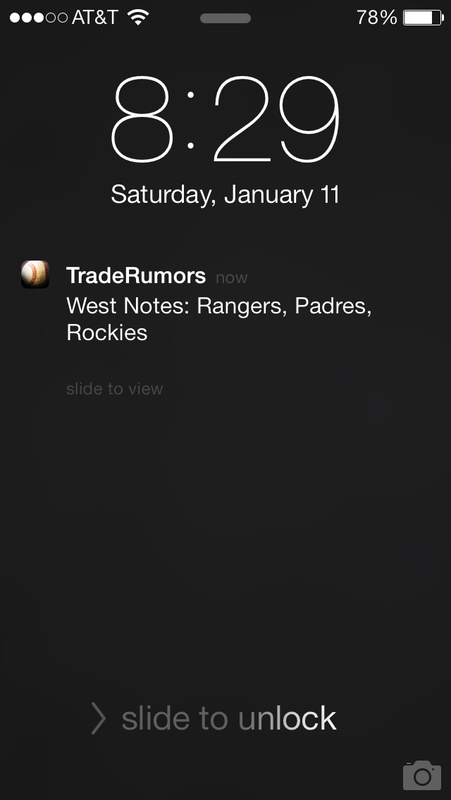 Enter “MLB Trade Rumors”. This is a website that I’ve been following for years, and if you’re at all interested in baseball transactions, I can’t recommend them enough. 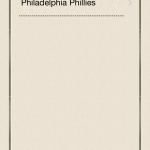 The website is available here, for free: http://www.mlbtraderumors.com – that’s been that way for awhile, and is a valuable tool. However, we can’t always be around our computers, and there are mobile apps available for iOS & Android. Those aren’t free, but are WELL worth the cost of the app. The app costs $2.99, which is pretty darned cheap given what you get with it. 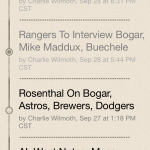 Officially the app is known as “Baseball Trade Rumors”, and not “MLB Trade Rumors” like the website is. 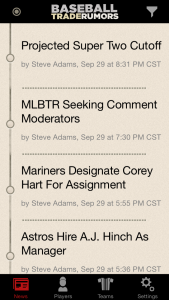 I suspect that has something to do with the name “MLB” and licensing, but that’s a non issue. 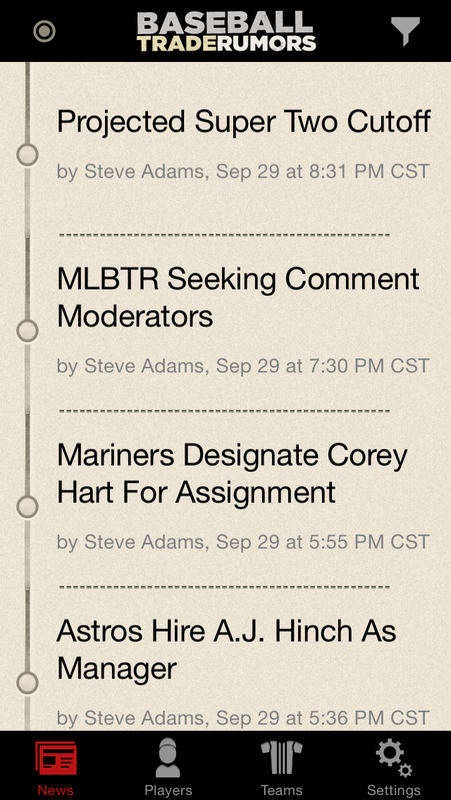 Ionly point it out in case you went searching for “MLB Trade Rumors” for the app name, you won’t find it that way. 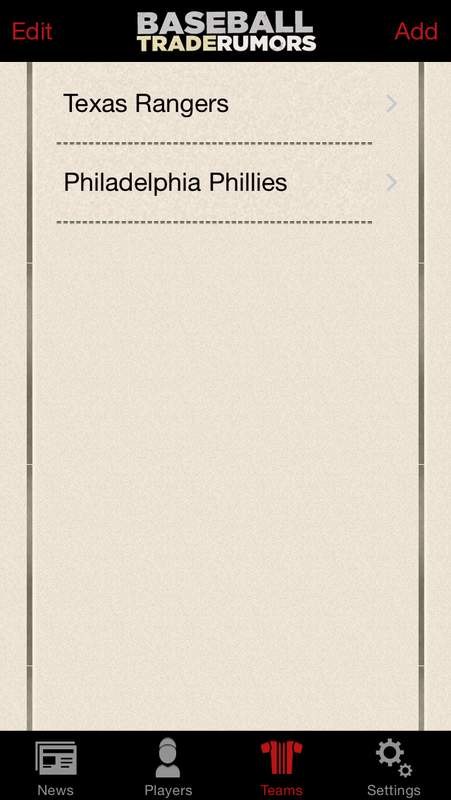 The app is HUGE around certain times of the year (Winter meetings, Trade deadline, etc). 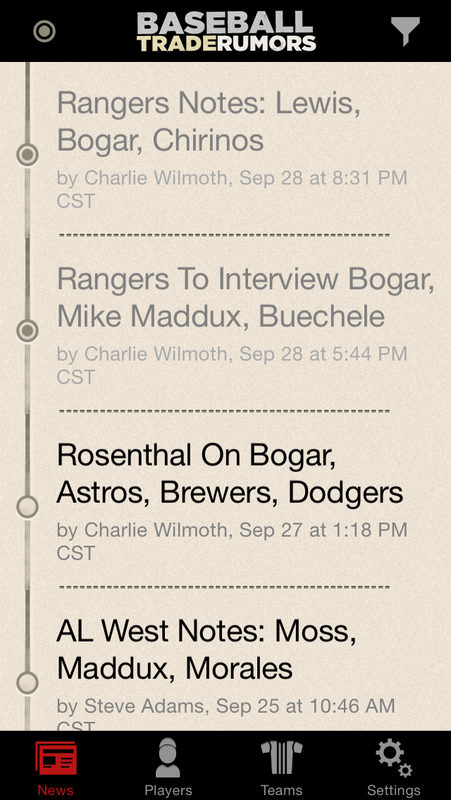 This is a great way to keep up with “up to the second” transaction rumors and whatnot. There’s other ways to get this info for sure, but I’ve found given all the hard work it is to keep track of it all, these apps do a great job sorting it down to the individual nuggets you’d want. Now, I have an iPhone and an iPad, so how the Android version works specifically, I can’t say. My brother has that, and from what I can gather it is mostly the same – but I can’t speak from first hand experience there. I can speak from the iOS app. 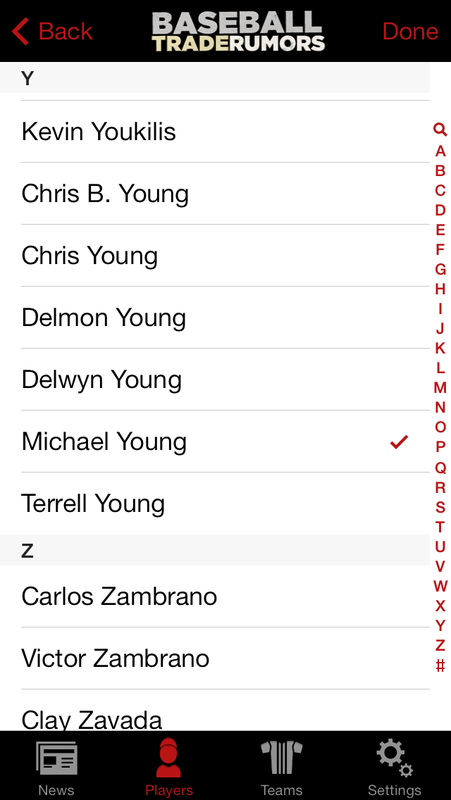 You can get notifications on your phone by team, by individual player, and by league. You can also tell it to notify you of actual transactions and not just rumours, also sort by just one team set of news, the info is quite flexible in the app. The notification system is the strongest point of this app for me, because otherwise it’s an app version of a website, and I could just look at the website for the same info. But the notifications are the reason I bought this app. 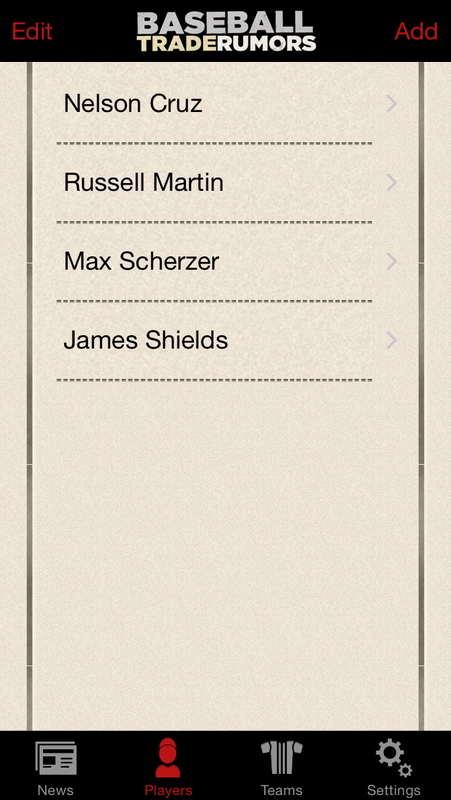 In the screenshots below you can see a few examples of the ways you can set up things to be notified about. This is a universal app, and works on the iPad too, but is one of the rare apps that I don’t like the iPad interface, and wish I could run the iPhone interface on the iPad just double spaced. There is only one other negative thing I have to say about the app. 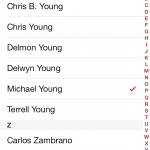 You can’t use it to send stories to your friends (via text msg, email, or Facebook). The only thing you can do with individual entries is tweet them. Which is fine, but I don’t always want to do that. Hopefully that gets changed in a future version. But this is a minor quibble, and isn’t a dealbreaker for me. 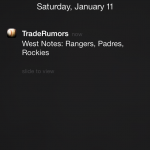 Baseball Trade Rumors is probably my second most used iPhone baseball app (the first being the MLB At Bat app). Mostly because this keeps track of trade info all the time, and I make use of the track by player feature, so I get notified on my phone when something happens with those players. I don’t have very many apps in the Notification center on my iPhone to help conserve battery power, but this one definitely lives in the notification center! If you’re a fan of transactions, I STRONGLY urge you to look into this. Very useful tool. Old screenshot showing notification on my phone’s lock screen. Usually towards the end of the year, we always hear about how many players the Texas Rangers have used overall in any particular season. The Rangers are usually towards the high end of that list. Injuries, callups, usually make for a long list, and you tend to forget the guys who are here so quick that they don’t even have time for the proverbial “cup of coffee”. I’ve done this for the last five seasons, and it’s worked out pretty well. I’ve also gotten some positive feedback on it, so it’s become a permanent feature here. If you’d like to see the final tallies for the other years I’ve done this, you can still see them here: [ 2008 | 2009 | 2010 | 2011 | 2012 | 2013 ] Anyway, this post will get bumped whenever there is a player who is making his first appearance for the Texas Rangers in 2014. I am going to count guys who get called up, but don’t play immediately (or sometimes don’t play at all), as they will be part of the 25 man roster officially. So here goes. * The total number of pitchers/position players do not add up because Mitch Moreland (May 6), Chris Gimenez (Jul 10), & J.P. Arencebia (Aug 13) all pitched an inning and count as both a position player and as a pitcher. Apparently the Rangers don’t officially count guys who are called up and sent down without actually playing (Miles Mikolas) – but I do. In 2014, the Rangers have just one in the original opening day 25 that were making their major league debuts (Seth Rosin). The previous years’ counts in that regard were two in 2013 (Leury Garcia & Smokin’ Joe Ortiz), 2012 (Darvish & Ross), one in 2011 (Mason Tobin), none in 2010, one in 2009 (Elvis Andrus), and one in 2008 (Kaz Fukumori). We have 11 players making their debut as Texas Rangers: Pedro Figueroa, Seth Rosin, Joe Saunders, Shawn Tolleson, J.P. Arencibia, Chris Gimenez, Prince Fielder, Donnie Murphy, Josh Wilson, Michael Choice, Shin-Soo Choo. NOTES: This seems like a “reward the long time minor leaguer” with a callup. 21 games left in the season, and you call up a guy with 13 years of experience covering slightly over 1,000 games. Not the long term answer of course, but a nice move by the team for a guy like that. NOTES: Jim Adduci was placed on the concussion DL after banging his head on the wall sliding to catch a foul ball. Felt bad for him, because while no one wants any injury to happen, I hate seeing ones like that, where they get hurt hurt just playing the game, not doing anything dumb, or stupid or anything like that. Ryan Rua is the latest in the line of “who” filling our 25 man roster this season. NOTES: Well, the barrage of injuries continues, even way past the point where it will make any difference. Shin-Soo Choo has been officially shut down for the rest of the 2014 season with a bone spur in his elbow. It’s only year one, so I’m not ready to put his contract signing up there with Chan Ho Park, but so far, this feels like bust. I hope he turns it around next year. Michael Choice was called up, another guy I had super high hopes for when the season started. In other news, Tomas Telis (who?) was purchased from AAA, and becomes the 57th overall player the Rangers will have used on the big club this year when he actually starts. He’ll also be the 13th player making his major league debut for us in 2014. Just wow.